Fans of John Cleese’s “Fawlty Towers” will recognize this from the episode where Manuel thinks that the chef, Terry, has put his pet rat, Basil, in ratatouille. 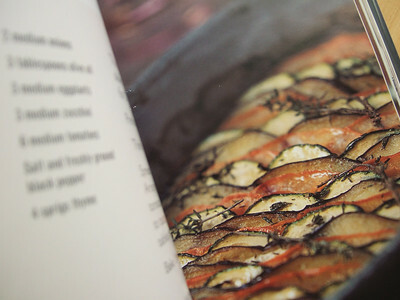 My trials with ratatouille went from being mundane to fascinating after I watched the movie Ratatouille. The namesake dish in the movie is based on Thomas Keller’s ratatouille recipe and I was inspired to try it out. And it was love at first bite. 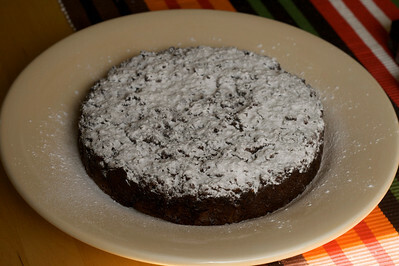 Keller claims that his recipe is cleaned up version of “Imam Bayildi (Imam Fainted)”. Since then, I have read Guy Savoy, the renowned Parisian chef, claiming the same. In Bayildi, young Italian eggplants are stuffed with fried onions and cooked in a tomato pomegranate sauce – makes one swoon with delight if not faint altogether. I don’t quite see the connection between bayildi and ratatouille but I accept the wisdom of these great culinary giants. 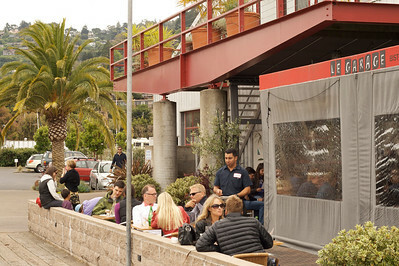 A weekend lunch with my sweetheart, after a gorgeous drive over the Golden Gate bridge, to the beautiful seaside town of Sausalito… If Le Garage, the popular French bistro in Sausalito, gets any closer to the sea, it will have to be a floating restaurant. Le Garage’s ambiance is perfect. The place is hip and causal, like a smartly dressed woman you want to be seen with. From the patio, the view of bobbing sail boats and flying sea gulls sets the mood. Our waiter at this particular lunch was a tall, dark and handsome young man, who got down on his knees by the table for our order – makes a girl feel special even if she is with her sweetheart. I was in a lovely mood this far. Our order – moule frite and squash blossoms stuffed with crab.